Made of Walking (VI) Sound and Ecology. Amazone Forest 2019. Made of Walking (VI) Sound and Ecology calls on all interested to participate to a gathering and creative exchange in the Amazon Rainforest, between 8-14 September. Made of Walking (VI) Sound and Ecology extends furthermore from 8-14 September as a global symposium of sustainable arts, science and design, under the name eAmazonia, as an immersive residency in the Amazon rainforest, which aims to be a gathering, school, platform and a collaborative creation space, combining immersion in the Amazon Rainforest and a global digital project, for artists, creatives, researchers, entrepreneurs and all interested in collaborative practices, and dedicated to sustainable arts, eco-arts, science and innovative design in an ecological context of deep Amazon rainforest. Participants will have the opportunity to present and share their artistic and scientific research - to collaborate and to create art projects or workshops in the Amazon, , related to the topics above and sound walking. The outcomes will lead to a nomadic exhibition in significant art spaces in São Paulo, London and Miami, accompanied by an academic and artistic publication/catalogue. The symposium is academically supported and accredited by IMATech-Institute for Arts, Technology and Mathematics in Sao Paulo, Brazil. As the gathering in the Amazon rainforest will take shape as an expedition it requires considerable costs to be secured by the artists themselves or by funding in their own countries/institutions. As a core group, the three artists propose working on environmental issues with a global and independent media orientation. It belongs to their ambition as artists to foster alternative images and discourses, advance ecological economies and humane policies, going against the mainstream corporate goals, in the awareness that the future of our world is carried by a humanity embracing and creating different paths then the ones imposed by global media enterprises and large corporations. By bringing together their artistic practices and approaches the three artists organize this collaborative creative gathering to share their creative practices, their concerns and their solutions with other artists, creatives, researchers and all others interested in the Amazon Rainforest. Made of Walking (V) walking bodies 2019. 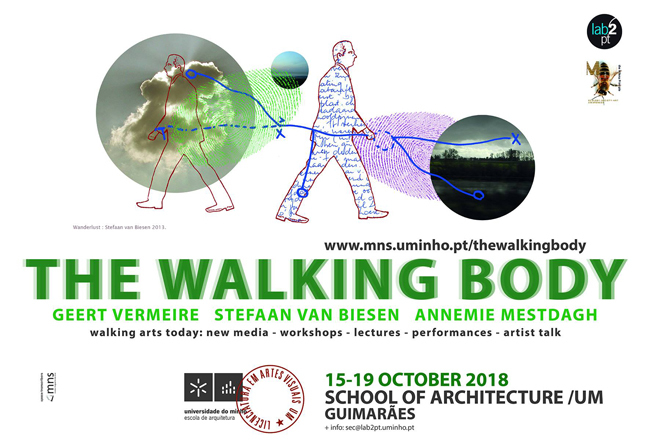 Made of Walking (V) will be hosted by the Department of Fine and Applied Arts of the University of Western Macedonia in Greece and takes place as a joint event with the International Encounters/Conference “WALKING PRACTICES/WALKING ART/WALKING BODIES”. The International Encounters/Conference will be held in the Prespes area of Greece, an unique natural environment with two lakes (Megali Prespa and Mikri Prespa) and a perturbing history of war and displacement for almost 50 years the 20th century, it is still a place of passage today and divided by borders with Albania and FYROM (Macedonia). The theme of “Walking bodies” refers explicitly to walking together and to groups on the move, embodiment, the nomadic process, migration, the concept of home. Artists and walking creatives are invited to participate to a residency of a week (arrival in the village of Parades, to create an in individual project open for participation or group project involving walking exploration of the Prespes area. An exhibition with the ongoing results of these walking explorations will be realised in the new Byzantine Museum of Agios Germanos in Prespes, and will travel afterwards as a nomadic exhibition worldwide. The residency will be concluded with a three day international conference (5-7 July) in the nearby village of Lemos about walking bodies and walking arts today in general. The encounters and exhibition are coordinated/curated by Geert Vermeire and Yannis Ziogas, rector of the Department of Arts of the University of Western Macedonia. The event will take shape in collaboration with a global scientific/artistic committee. Artists and all walking creatives are invited to apply for the residency and/or to present their work at the conference. Arrival for the residency June 28th to Sunday June 30th till July 7th. Arrival for the conference latest afternoon July 4th. Also attendees are welcome to participate. Registration is open from now on. Online info group sessions about the region will be organised monthly for artists/creatives desiring to prepare a specific walking project for the area. For students limited free accomodation is available in the dormitory of the School of Fine Arts. Free camping facilities wiil be offered in the garden of the school and at the shore of the lake. Further accommodation (to be paid by the participants) available in guest rooms and hotels for prices starting at 25 euros/individual room/night. Flights to Thessaloniki and Athens, further transportation by bus/train. [Meander III] performance/walk with the students, Minho University. Concept by Stefaan van Biesen & Annemie Mestdagh. Wander Weed. [Stefaan van Biesen, Annemie Mestdagh]. A performative walk with Stefaan van Biesen, where participants explore a nomad work of art on a shared walk with 5 people at a time, along the readings a of poetic letters by Stefaan van Biesen (Letters to a Tree). Production: Annemie Mestdagh. Concept: Stefaan van Biesen / the Milena principle. Outdoors. [Made of Walking (IV) 2018] Neon Chorio [Akamas Peninsula Cyprus] 29.06 < 08.07.2018. Sites embodied / Nature Embodied 2018 is a continuation of the project Sites Embodied Cyprus during Pafos2017, focusing this year on the villages of Neon Chorio and Smigies in the Akamas Peninsula, inviting Made of Walking / Plant(e)scape, in a collaboration with Dance Gate Lefkosia, University of Nicosia, Fine Arts and Neapoli University Pafos, School of Architecture. Theme of Made of Walking this year is Plant(e)scape, relating to human motion and emotion in a plenary botanical background, and combining walking as a creative instrument with two emergent sciences: Spaziergangwissenschaft (promenadology) and Critical Plant Studies (Vegetal Philosophy: Plant-Thinking). Promenadology is a "tool" to explore our everyday living environment, as well as for delivery of content and knowledge, in combination with Critical Plant Studies, considering the plants as living entities with their own consciousness, as thinking, sentient beings, not mere objects to be studied and classified; they are also agents in the production of meaning. Following the logic of a symbiotic being in the world, (shared by humans, animals and plants), where the anthropomorphic centrality is lost, we aim to recover a vegetal point of view and creating new ecological meanings that may deepen symbolic and aesthetic levels. The gathering will feature live performance works, workshops, lectures, round tables with established and emerging performance artists, walking artists and with researchers. Live performances by the participating artists and students: to be held in landscape / countryside throughout the event with the participation of the general public/local residents. Public talks, presentations and conferences, open to anyone interested. An open an international digital platform during and after the event, extending the gathering on a worldwide level, including streaming and live podcasts of the actions and talks to the broad network of Made of Walking and Talking Walking / Museum of Walking. Concept Plant(e)scape by Simona Vermeire. Walking on, after Made of Walking in Delphi and in Le Romieu in Summer 2017. 80 artists, dancers, movement artists, composers, sound artists, theatre artists, writers, poets, researchers and other walking experts/practitioners from literally around the world found each other in the Greek Parnassos and in the French Midi Pyrenees to share, to learn, to question, and to gather. One conclusion emerged: walking is a yes in our world, walking is utopic. Walking works. Marcher, ça marche. [Made of Walking] Geert Vermeire and the art of walking the urban landscape. Read the schedule workshops during Made of Walking La Romieu France - English version [see pdf file]. Table of walks is project initiated by the Milena principle (B). Within this pilot year there was as well a Summer School of Walking in Delphi (GR) in the format of a forum with a series of walks and walking workshops, focussing on dialogues between performance, arts, literature and new media, inviting artists, writers, walkers, performers, musicians and composers, sound designers, new media artist, developers, teachers, researchers, experts and scientists of different fields, to share their experiences and to explore together topics related to walking practices. The event was attended by 100 participants with 25 walking artists and experts from the US, Australia, Singapore, South Africa, Egypt, Israel, India/France/UK, Portugal, Holland, Belgium, Turkey, Cyprus and Greece. Read the full programme of Made of Walking La Romieu France - English version [see pdf file]. The forum in La Romieu is co-curated by Isabelle Clermont, Gilles Malatray (Desartssonnants, Lyon) and Geert Vermeire (coordinator the Milena principle / Urban Emptiness Network) in dialogue with Robin Decourcy (TrekDance) and Andrew Stuck (Museum of Walking / Walking Artist Network UK). The forum is hosted by the artistic organisation Le Bouc qui Zouke the municipality of La Romieu. It intends to stimulate a meeting between researchers and artists related to walking. CRESSON Grenoble is approached as an academical partner. Proposed theme: 'Sometimes we walk on the ground, sometimes on sidewalks or asphalt, or other surfaces. Can we find ground to walk on and can we listen for the sound or sounds of ground? Are we losing ground? Can we find new ground by listening for it?' Pauline Oliveros, October 22, 2016. Sound Walk Sunday - open call for contributions. Sunday 27 August is the inaugural Sound Walk Sunday, worldwide inaugurated from Made of Walking in La Romieu in collaboration with Andrew Stuck - the Museum of Walking, and we want to hear from you of suggestions for audio, geo-located, immersive performance or sound walks as we want to build up a directory and map in time for Sound Walk Sunday. Read more below and suggest a walking piece and find out how you can contribute. We are researching artists, performers and producers who have created audio walking pieces of their own. Even if it is past and all that's left is an archived piece - we are hoping too that there may be current work that could be tried out by the public on Sound Walk Sunday. Is there budget, time or effort capacity within your networks that we could tap into in the weeks coming up to the 27 August? Could we be invited on to a show to talk about / or write copy for a blog / column describing what we are trying to achieve? Contact us here. We are drawing on volunteer support at the present time. In due course we would like to have a mechanism to crowd source examples of "walking pieces" from around the globe. Ten years ago when Web 2.0 and geo-located pieces were "new media", networks / forums of producers and artists evolved and may have created directories or maps, but now it's mainstream and no longer 'new' media and the initial surge for cataloging has diminished. Today little appears to be mapped and yet it is more easily created than ever - Sound Walk Sunday could be seen as nostalgic, but we think it could - with the right ingredients, including yourself and others - offer a popular platform for digitally enhanced walking experiences. So we have designated Sunday 27 August as Sound Walk Sunday and we are on the look out for audio-enhanced 'walking pieces' or listening walks so as to create a directory and map - would you know whether anyone has ventured down this path of mapping such work before? or whether there is a bibliography or directory of 'walking pieces' on which we can draw? If you do contact us here. [Bom Fim Talk] Rosária Forjaz & Stefaan van Biesen.Made Of Walking (III) La Romieu France 2017. A Bom Fim conversation between the Portugese artist Rosário Forjaz and Stefaan van Biesen (Belgium) about the art project 'Meander' and 'the Library of Walks' in the Escola Artistica de Soares dos Reis in Porto 2019 by Stefaan van Biesen & Annemie Mestdagh. Also a conversation about their contribution and performative walks: ['Light Walk' and 'Enter The Triangle'] during Made of Walking (III) in La Romieu France August 2017, an international meeting of artists who work on the theme of 'walking'. Camera: Annemie Mestdagh / the Milena principle 2019. Time: 21:53. [Listening: On The Architecture of Aging]. Made of walking La Romieu 28.08.2017. ARTIFACTS : Pam Patterson & Leena Raudvee [CAN]. Registration and video by Stefaan van Biesen/the Milena principle. [Midamble] Peter Jaeger [CAN/UK] Made of Walking La Romieu France 30.08.2017. Midamble. 31.08.2017. Extract of a durational walk & reading performance by Peter Jaeger (CAN/UK) during Made Of Walking at La Romieu France 2017. Location: Le Lavoir, (an historical washing place). Text and performance : ©Peter Jaeger. Video: ©Stefaan van Biesen/the Milena principle. Midamble is a long text that was composed at sacred sites and on pilgrimage routes in Asia, Europe, North America, North Africa, and the Middle East. A durational reading-performance of Midamble will be situated along the Camino route. The text will thus dialogue with the sounds of the local, natural environment and with walkers and pilgrims on the Camino, over a reading period of several hours, as an analogy with the time taken to walk long-distance footpaths. [Enter the Triangle] Stefaan van Biesen [B] Made of Walking La Romieu France 2017. Enter the Triangle. 27.08 > 30.08.2017. 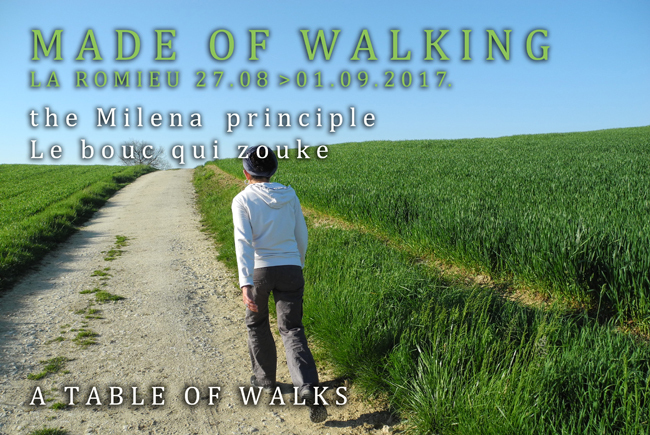 A silent meditative walk/performance for 3 walkers, during Made of Walking La Romieu 2017. With Annelies Vantyghem (B), Niran Baibulat (FIN), Rosario Forjaz (PT), Andrew Stuck (UK), Mel Sutton (UK), Ivana Pinna (IT/ES), Guendouz Nawal (ALGERIA/ FR), Carol Mancke (US), Phillip Mckenzie (UK), Leo Kay (B/UK), Pam Patterson (CAN), Leena Raudvee (CAN), Ruth Roadbent (UK). The Enter the Triangle performance (Silent Movements) is a gentle walking performance where three participants are required to listen to each other's body and the movements they make towards their own body. It is based on how to relate to another one's ways of moving or physical dialect: so to become aware of the other(s). At the same time to be aware of the urban environment and the fact that although you are connected, there is always a feeling of disconnection between you and the others. Being able to touch and still being in the distance. It can be seen as a mental exercise to trust the other(s). To follow the other moving bodies while moving in space and to become a moving shape of consciousness. A flow, a living human sculpture, constantly changing shape of a triangle by interactions. 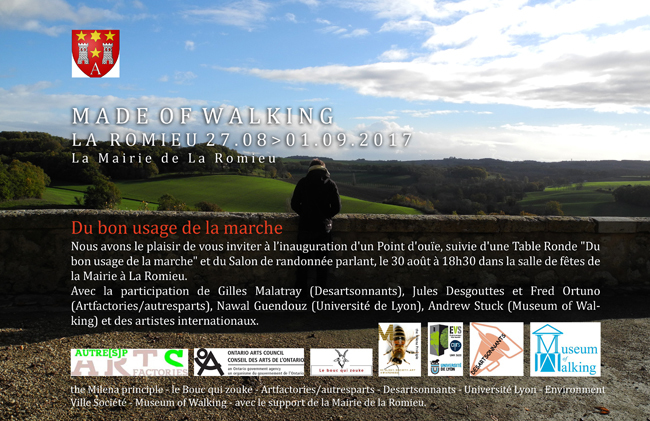 [Made of Walking 2017] - La Romieu France 27.08 > 01.09.2017. Nous avons le plaisir de vous inviter à l’inauguration d'un Point d'ouïe, suivie d'une Table Ronde "Du bon usage de la marche" et du Salon de randonnée parlant, le 30 août à 18h30 dans la salle de fêtes de la Mairie à La Romieu. Avec la participation de Gilles Malatray (Desartsonnants), Jules Desgouttes et Fred Ortuno (Artfactories/autresparts), Nawal Guendouz (Université de Lyon), Andrew Stuck (Museum of Walking) et des artistes internationaux. Nous avons le plaisir de vous inviter à l’ouverture du Festival Made of Walking et Sound Walk Sunday en présence des 35 artistes internationaux le 27 août à 18h30 dans la dans la salle de fêtes de la Mairie à La Romieu. SOUND WALK SUNDAY est un événement mondial qui sera inauguré à Made of Walking - La Romieu et sera fêté par la suite chaque année à la même date. 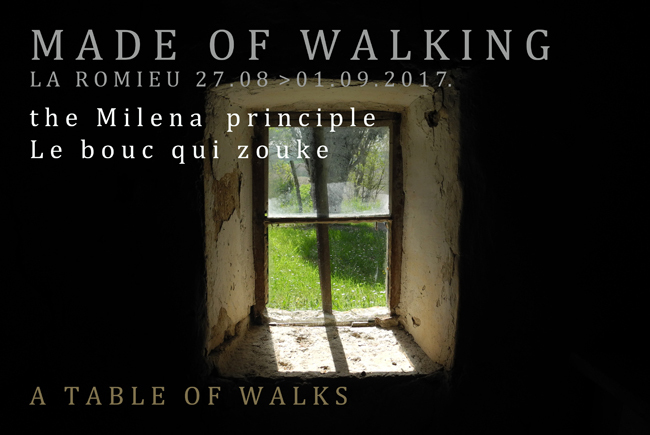 [Made of Walking (II)] the Milena principle summerschool Delphi Greece 10.07 > 23.07.2017. 10th of July to 24th of July, Delphi Greece 2017. The Animart Experiential Arts School and Forum of Contemporary Artists, the Milena principle organizes a forum with a series of walks and walking workshops, focussing on dialogues between performance, arts, literature and new media, inviting artists, writers, walkers, performers, musicians and composers, sound designers, new media artist, developers, teachers, researchers, experts and scientists of different fields, to share their experiences and to explore together topics related to walking practices. With contributors from the US, Canada, Australia, Singapore, South Africa, Egypt, Israel, India/France/UK, Portugal, Holland, Belgium, Turkey, Cyprus and Greece. Read the full program of the summer school 2017. >> download pdf. 10th ANIMART – Experiential Arts School and Forum for Contemporary Artists will be held in Delphi, on July 10 - 24, 2017, in collaboration with Athens School of Fine Arts (Greece) and Bezalel Academy of Arts & Design, Jerusalem (Israel) and the Milena principle (Belgium) bringing together academics, students, experts and renowned artists from Greece and abroad. the Milena principle is an internationally operating platform and an artistic creation and research lab towards interdisciplinary practices within performance arts and new media, with a specific interest in the topics of ecology, sound, science, society and awareness. "MADE OF WALKING", is organized by the Milena principle during ANIMART, with a series of screenings, workshops and conferences relating to walking, focussing on dialogues between performance, arts, literature and new media, inviting students, (young) artists, writers, walkers, performers, musicians and composers, sound designers, new media artist, developers, teachers, experts and scientists of different fields, to share their experiences. Projects/performances are meant for following outdoor venues: yard of the Delphi Archeological Museum, the archeological site of Delphi and Delphi village. 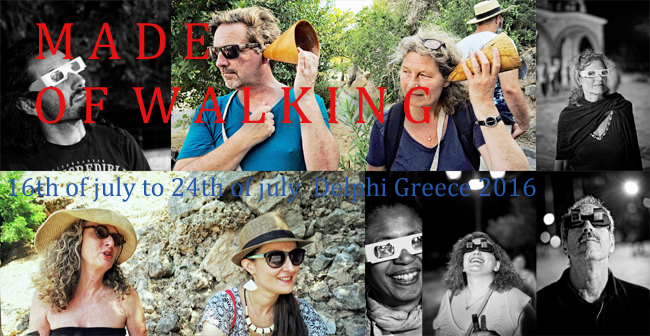 [Enter the Triangle] Made of Walking (I)] summerschool Delphi Greece 20.07 > 21.07.2017. [Enter the Triangle] performance Made of Walking Delphi Animart Summer School 2017. Enter the Triangle. Performance for 3 walkers and dancers during Made of Walking Delphi 2017. Concept and video: Stefaan van Biesen/ the Milena principle. Attribute made by Annemie Mestdagh / the Milena principle. Performers: Lina Efstathiou, Eleni Nakou, Julia Redei, Penny Finiri, Leand Kalaja, Panagiotis Lezes, Aliki Arnaouti, Ioanna Thanou - Mikro Skordopsomo, Chara Tzoka, Marianna Makri, Vermeire Geert and Haris Pellapaisiotis. The Tortoise and the Spider] a walking harp, Delphi 23 juli 22:48. 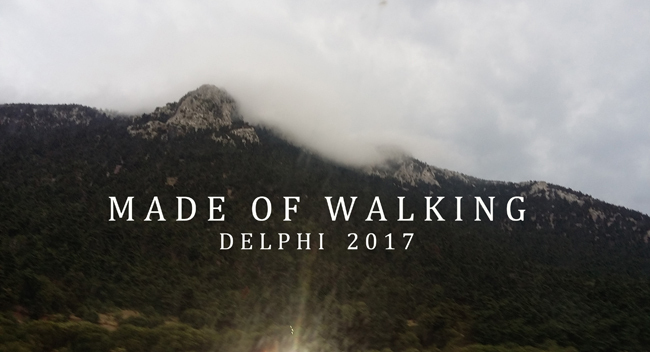 Made of Walking Delphi 2017 focused on outdoors movement practices and new technology / live electronics, inviting to new ways of co-operation in sound and movement while connected as (micro- or macro-) walking "webs" of people. Ros Bandt, Jon Drummond, Vermeire Geert and Katerina Drakopoulou were engaging with a group of movement artist/dancers in a collaboration of making a giant illuminated people spider aeolian harp which can be played and moved around, walking at night, connected with strings. A new sound composition was played with attached portable speakers and sound elements on the movement artists/dancers. The process involved the creation of a "human harp", a group in movement connected with each other and a tortoise harp, playing the strings that connect them in their trajectory, resonating with the ground and the landscape. The performance will continue as a digital platform connecting webs of walkers around the world. 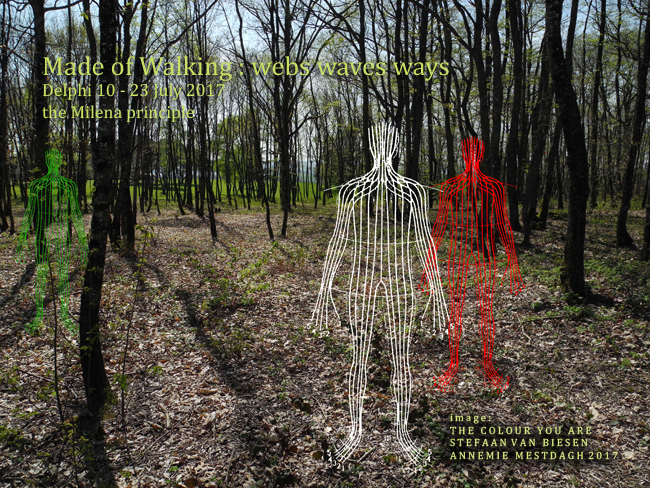 Evolving the act of walking in sound waves and webs is the conceptual and artistic proposal of Made of Walking in Delphi, focusing on ways of unfolding steps that restore a sound score of the dialogue between humans and the ground. In a broader sense, this rhythmical duet intends an ecologic ‘sculpture’ of the earth through various walking webs. In order to create an orphic mapping of these “erratic” places and spaces. Alexandra Pambouka, Cyprus. July 17- 23, 2017. The human being has always been moving for survival οr progression. Memories, customs and traditions are his only heritage - House. In a shifting period the traditional patterns are not reproduced the same. Someone can ‘knit’ their own history by taking the "found threads" according to their measures. The artwork can be in a continuously change (like humanity). It can be applied in any space, be rolled, be stretched and fit in a suitcase. Every time that it will be exhibited it will be in a different form. The process of the installation could be a performative process in a public space, calling the audience to add their woven pieces. As a result the artwork will be a socially engaged practice. Inspired from the urban and natural environment and the history of Amfissa, Alexandra sets up an installation using weaving techniques. The installation will be an interactive process with Amfissa’s residents, by asking them to add their woven pieces on the existing artwork "Found threads". A participative art work by Alexandra Pambouka during Made of Walking Delphi 2017. 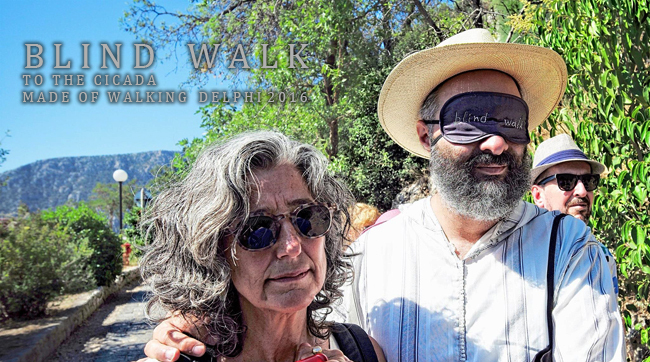 [Made of Walking (I)] the Milena principle summerschool Delphi Greece 16.07 > 24.07.2016. As a pilot within the Animart Experiential Arts School and Forum of Contemporary Artists, the Milena principle organizes a forum with a series of walks and walking workshops, focussing on dialogues between performance, arts, literature and new media, inviting artists, writers, walkers, performers, musicians and composers, sound designers, new media artist, developers, teachers, researchers, experts and scientists of different fields, to share their experiences and to explore together topics related to walking practices. Read the full program of the summer school. >> download pdf. 10th ANIMART – Experiential Arts School and Forum for Contemporary Artists will be held in Delphi, on July 16 - 24, 2016, in collaboration with Athens School of Fine Arts (Greece) and Bezalel Academy of Arts & Design, Jerusalem (Israel) and the Milena principle (Belgium) bringing together academics, students, experts and renowned artists from Greece and abroad. Walking performance by Adonis Volanakis (New York/Athens). Reading the moment [Walking - Observing - Sensing - Being] Athens Greece 2015.